"So, what's the most important thing a person can do for their partner?" Then answer that question in the next paragraph. Each time you do this you move your reader along. Like any skill, however, it can be overdone- be careful. This is so educating, thanks for sharing. These tips are very good, so thank you for sharing them. Some of them I already use, but it's good to know I'm on the right track. One technique I sometimes use is to reference other blog posts or articles and then give my view on the topic. I think this could be especially useful to new bloggers who are trying to publish regularly but may not have found their "voice" yet. On that note, if I have nothing to say, I don't blog. Give yourself permission to say nothing when you have nothing to say would be another tip. That's when guest bloggers come in handy! @Kim Thanks for telling me about inserting questions between sections. Would love to look at an example of where a blogger is using it. Don't suppose you have a link? 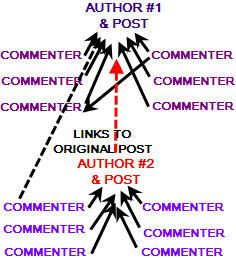 I'll often open my posts with questions (to grab readers attention) and then finish with posts (to encourage comments). @Claire Glad you like my tips. Another important one is the use of images. I didn't include the importance of effective use of images in this post because there is so much information you need to cover when talking about how to use images in blog post. Regarding when to blog and when not to blog - I agree about not blogging when you have nothing to say. However sometimes of suffer from bloggers block and it is necessary to focus myself to blog to get past it. It is not that I have nothing to say, although I might think I don't, but that I've got myself in a rut. Thanks for these helpful tips! I think your #3 is very important, and I'll even build upon this. Not only is it important to lead your readers to further resources, examples, and opposing viewpoints through hyperlinks, but it's also vital to credit those who have covered the topic/have inspired your post. Recently I wrote about Numbers vs. Humans in nonprofit storytelling - a piece that was prompted by much recent discussion about the topic. I referenced a theory with which I disagreed (and which ultimately inspired me to write about storytelling), and linked to a post that elaborated further. We're all building upon knowledge that bloggers have decided to share freely, let's give each other credit!